The reason why Benidorm is the great tourist centre of the Costa Blanca lies in its beaches and the wide range of leisure activities. Benidorm has one of the best beaches in the world. Just 25 miles from Alicante, houses hundreds of hotels, restaurants, bars and clubs. 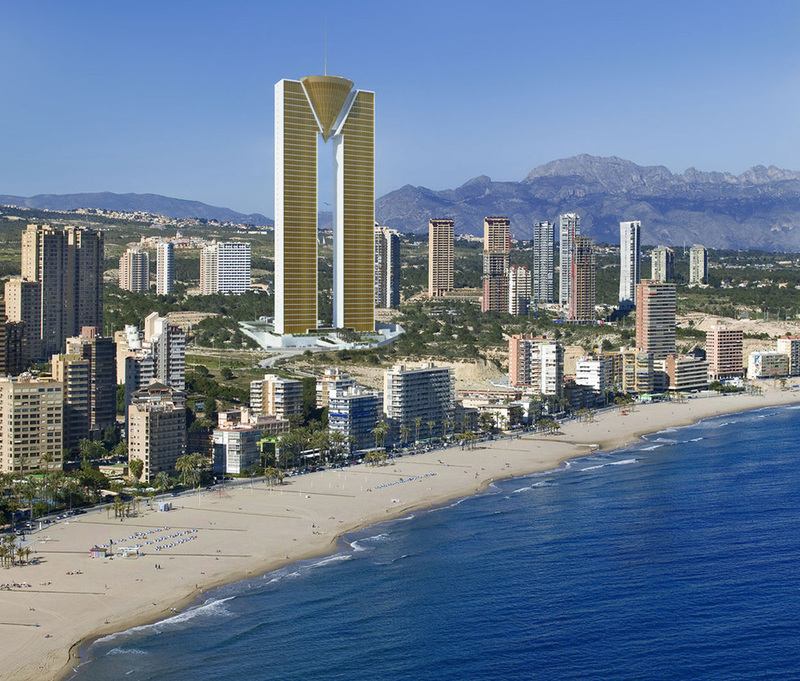 This is a picture of one the latest and tallest residencial buildings to be completed Benidorm and in the whole of Spain. It is called Residencial In Tempo. The fineness of the sand, cleaned daily, the quality of the services and the clear waters are the main reasons why it attracts so many visitors. The Playa de Levante (the sunrise beach), where most bathers go, is two kilometres long and stretches from the town centre to the Sierra Gelada and the Rincon de Loix. In high summer the sheer number of people is both spectacular and colourful. The Playa de Poniente (the sunset beach) goes from the old town as far as Finestrat Cove. This beach has sand as fine as the Levante beach but is quieter. Between the Poniente beach and the old town there is a cove known as Mal Pas beach, reached from the port or one of the stairways which go down from the castle. Since the 1950's Benidorm has changed dramatically in its appearance, once a small fishing village it is now a sprawl of skyscrapers and hotels.Benidorm has cleaned up its act since the 80's and now the young British holiday makers and 'lager louts' who gave it a bad name are no longer the majority of the tourists to this town. Now you will find more and more sophisticated tourists from England, Germany and Northern Spain come toBenidorm. The historical centre (Old Benidorm) lies around the Mirador of Punta Canfali (Vantage Point), the most emblematic image of Benidorm with its white stone balustrade which can be reached by going down a stairway. In the summer months you will find lots of stalls selling arts and crafts and hear the merriment of musicians and artists. Why not have your portrait done or one of the children - you sit - they paint. Near here is the Neoclassic church dedicated to St James the Apostle. From the Plaza de Levante you can reach the shopping centre by walking through typical narrow white walled streets. To walk round the impressive shopping centre, start at the Plaza Triangular and walk along Martinez Alejos, Gambo and Doctor Perez Llorca streets or the wide Avenida del Mediterraneo. Benidorm Palace offers a Las Vegas-style show complete with dinner with with dancers, flamenco, juggling, magicians and big band/orchestra. This venue has been featured many times on the well-known ITV television comedy series called Benidorm. Indeed many visitors to Benidorm try to find the locations used on the sets of the series. The hotel which is called the Solana is in reality the Sol Pelicanos Hotel. Neptunes Bar where many hilarious scenes have been filmed is a real bar called the Morgan’s Tavern which does have many good cabaret shows and tribute bands. Shopping Visitors to Benidorm can enjoy a great variety of shopping, from the markets, the cheap Chinese bazaars to the designer shops such as Zara at the La Marina Mall in Benidorm. The Carrefour supermarket in Benidorm is a huge hypermarket with many types of food from Spanish to English (British) and also popular is the Iceland supermarket. Theme Parks The other great secret of its success is the wide range of leisure activities on offer. There are endless possibilities for foreigners, natives, children, the young and old alike, to enjoy themselves. Walks can be taken in the Parque de Elche, excursions taken to the Sierra Gelada, you can go swimming on the best beaches of the Costa Blanca, go to the cinema, visit Terra Mitica a Mediterranean theme fun park, Aqualandia, Europe's largest water fun park and Mundomar, an animal theme park. Eat and drink in restaurants for all budgets, and practice sport such as sailing and diving and also enjoy the nightlife. What To Do At Night - Benidorm nightlife is famous and one of the main reason so many people come here throughout the year, not just summer. Needless to say Benidorm is packed with restaurants, pubs, bars, cafes and nightclubs, many of them English and Irish. Popular bars and clubs include Jokers, Chaplins, Lennons, Cafe Benidorm, Red Dog Saloon, The Western Saloon Bar, Loch Ness, Bahamas, Champions, Sinatras and The Heartbreak. Infamous acts and shows. There are literally thousands of bars and pubs and drink prices are very low (often €1 a pint!). As well as this, there are a lot of free entertainment such as comedians, cabaret, dancers, live bands and tribute bands such as Queen and Westlife, Lady GaGa and Adelle. This makes Benidorm a fun place for a hen weekend or stag weekend.